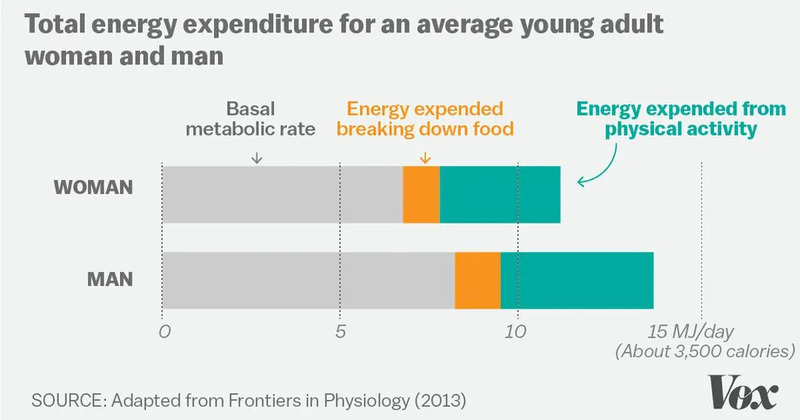 Take a look at this article by Vox, published in the beginning of 2019 – it explains the simple (but often forgotten) science behind how much more diet matters than exercise, when it comes to burning calories. Here’s also a much more in-depth piece (by the same author), based on more than 60 published scientific studies. The conclusion is clear – physical exercise accounts for a relatively insignificant amount of the calories you burn daily. Or, as I’ve been saying for years – it would take you up to an hour of brisk walking to burn off the energy in a serving of ice-cream. Of course, there is much more to health and weight loss than calories. The caloric model clearly doesn’t explain why some people(particularly the young ones) can stay thin even when eating in a caloric excess. There are many other factors, like leptin sensitivity, insulin secretion, diurnal variation of cortisol, water weight storage due to ADH reductions and many, many more. If you like to read more on those topics, take a look at my other articles, concerning those topics. prev Previous post: Artificial Sweeteners – Are They Hindering Your Fat Loss Progress, By How Much and How? Welcome to HealthShortcut.com! Since 2012, we aim to bring you the most accurate information on health, fitness and nutrition and a lot of little tips and tricks to bring you towards better health. Artificial Sweeteners – Are They Hindering Your Fat Loss Progress, By How Much and How? Those 14 Simple, Science-Based Weight Loss Hacks Actually Work – Implement Them Daily to Steadily Lose Weight! How a High-protein Breakfast can Transform Your Body! Powerful, Metabolism and Antioxidant-Boosting Morning Shots for Great Health and Weight Loss! The Amazing Benefits of the Detoxifying Salt Water Drink for the Thyroid and the Adrenals. Salt Water Flushes Toxic Bromide From the Body! Try This Green Juice Recipe for Weight Loss!